So, I have been derelict in posting these last sessions for citizen science, mostly because life got kinda busy (new house, new hobbies, new jobs, etc.) But, I am going to post these, mostly because they are important, and give me a good record of the programs that I have been running. 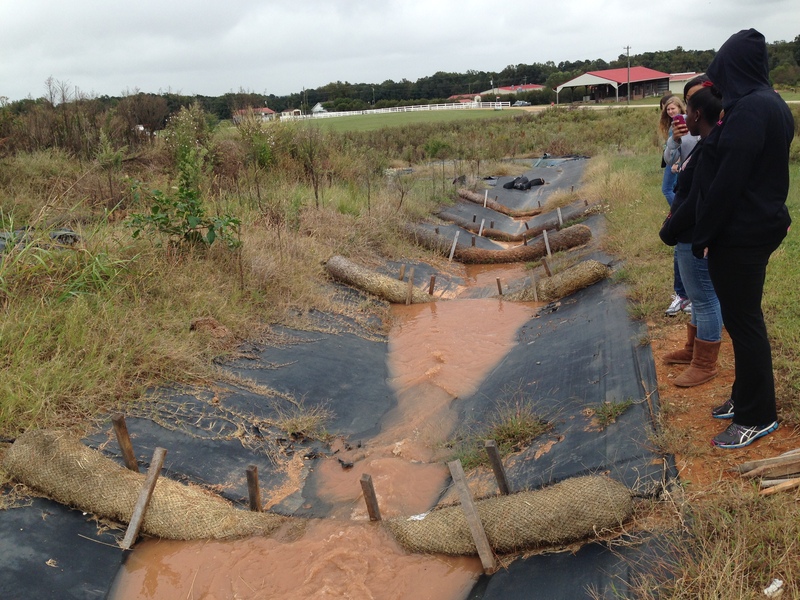 First things first, we went out to SECREF, the Sediment and Erosion Control Research and Education Facility (SECREF) at the Lake Wheeler Road Field of North Carolina State University. This unit is run by Dr. Rich McLaughlin, and is part of the bigger Stormwater Runoff Research Unit. Suspended sediments are the biggest pollutant of waterways in North Carolina. They can come from anywhere, including farm fields, gardens, and even lawns. However, the biggest source is construction sites. Obviously, we went out to this station, because we are trying to mitigate runoff. Working on a rain garden project to slow down erosion and increase settlement basins, it is very important to understand how it works. We had four different soil filled boxes that we put on an angle. 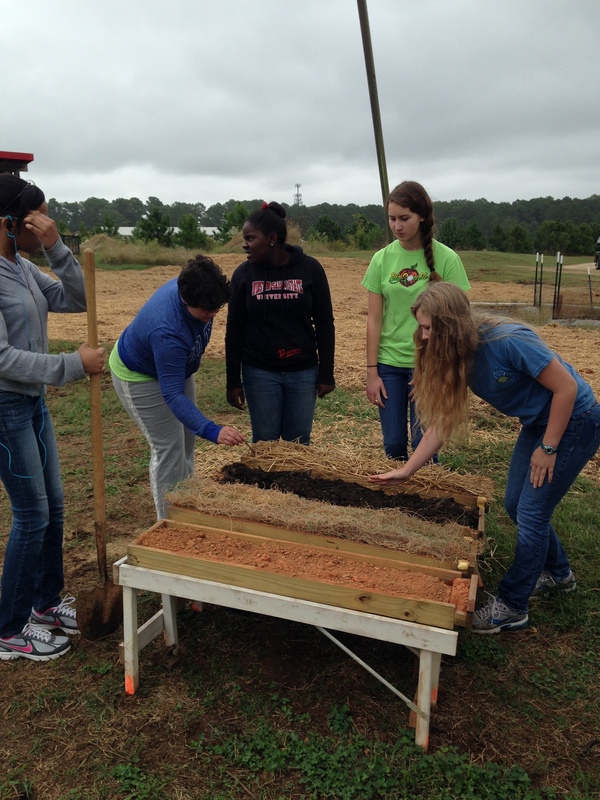 We used a red Carolina clay (Cecil) under a rainfall simulation unit. We had four different cover treatments: Straw, wood chips, and an aritifical coconut fibers woven together in a mesh, and a bare control. A majority of the girls thought that the straw or the coconut fibers would be most effective. There was a catch basin under the four buckets, so we can compare treatments. 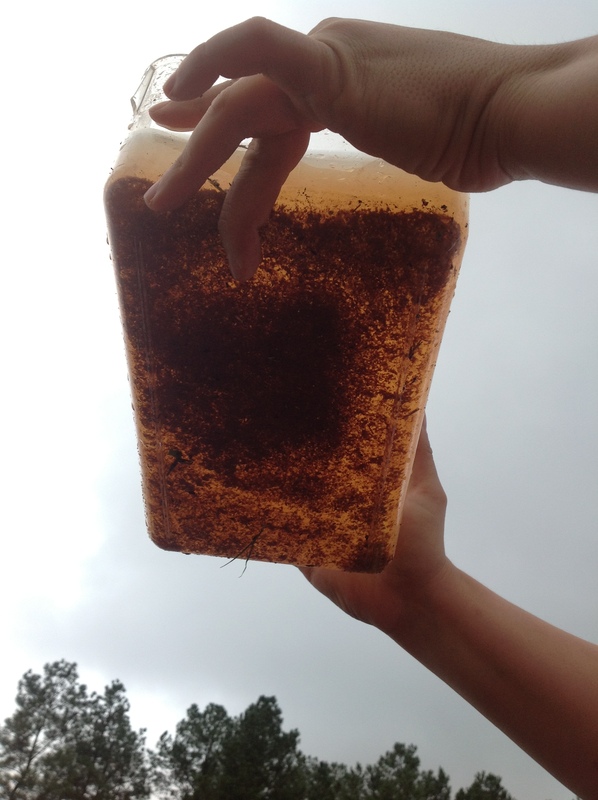 After letting the rain soak through their four samples, it was concluded that the woodchips actually provided the best filtering. Having their hypothesis disproven left the group intrigued and wanting to know more. Once the sediment is into the water, what can we do? There is a substance called PAM, or polyachrilamide. This substance is used to assist in the filtering of water by adhering to the particles in the water and making them clump together, or flocculate. After the PAM had sat in a sample of water for a few minutes, the water was clearing up, and the sediment was clumping together and settling to the bottom. 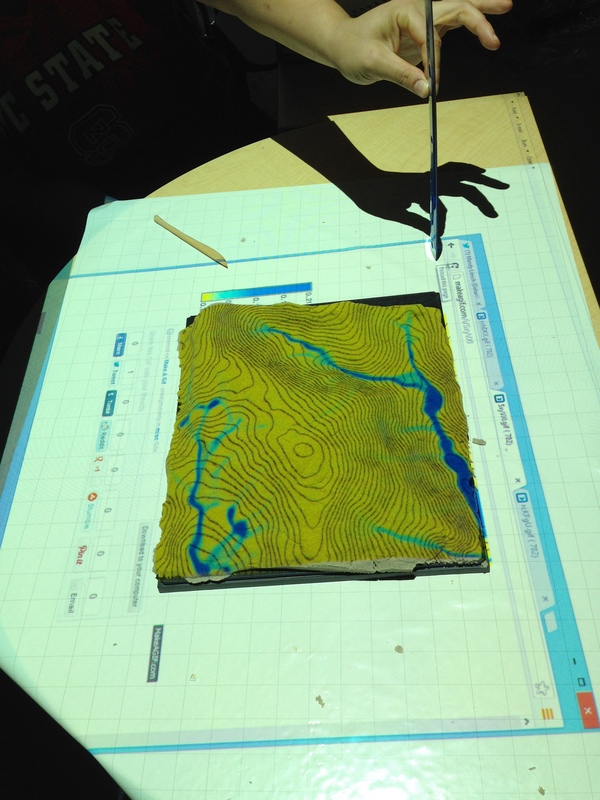 And then, we did a large scale erosion model like on construction types. The long plastic tarp prevents erosion, and the addition of waddles further slow down the runoff. A waddle assists in slowing the rate run off water travels by creating a “pond”. This allows sediment to settle. By adding PAM to the top of the waddles, the girls saw the increased in clarity of the water running through the ditch. We tried many different types of waddles, artificial coconuts fiber, actual coconut fiber, plastic, and other things. 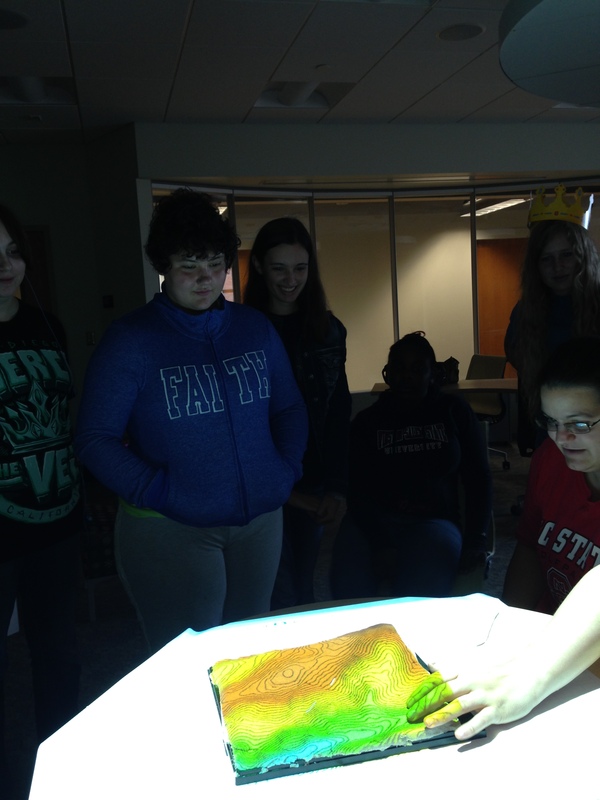 After the field trip (and lunch), we headed to the Earth Observation Center at NC State University. 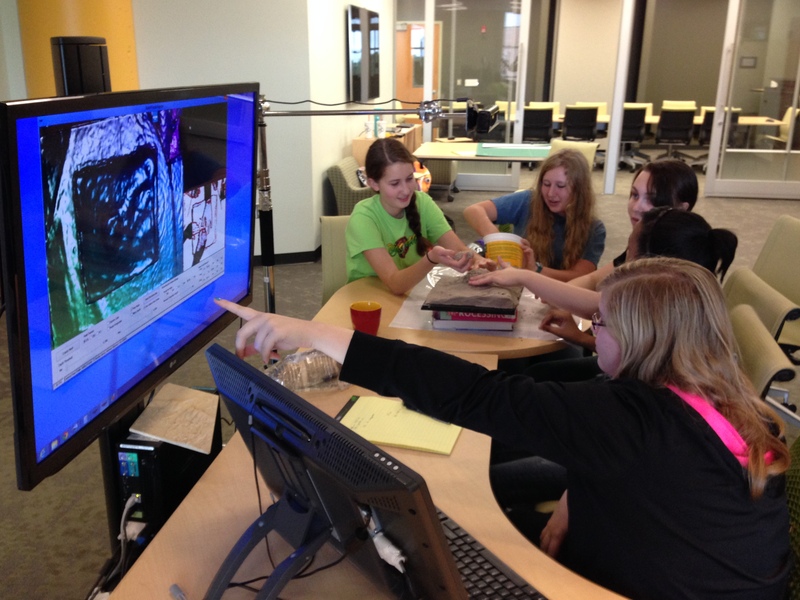 This is part of the multidisciplinary GIS program hosted out of the Marine, Environmental, and Atmospheric Sciences. The first week, we made a 3D model. This week, we brought the 3D model to the observation center. The rain garden is situated at Camp Mary Atkinson. The leadership center building was built in 2005. So, I had the topographic maps of the pre-development site. I used the kinetic sand to create a topographic map of the pre-development site, and generated runoff speed and models. After the girls got to see the speed and depth of the discharge. 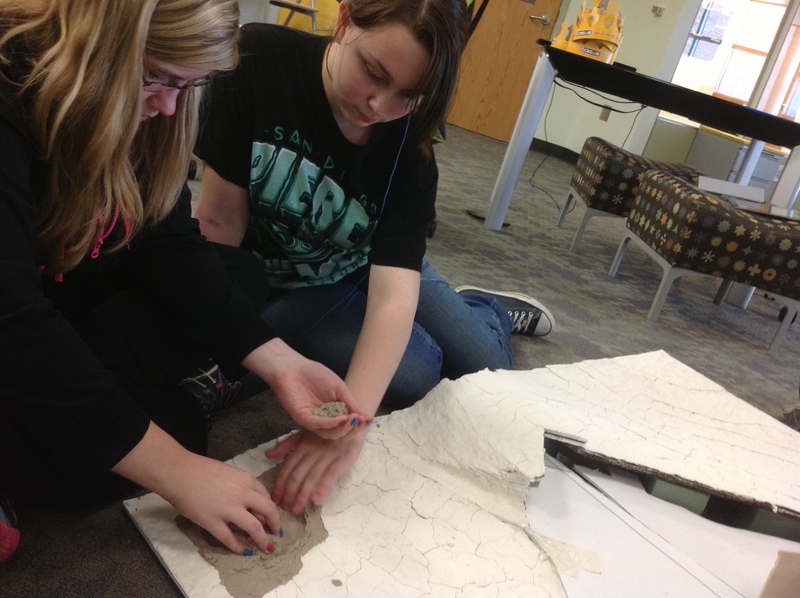 Then, they got to use the kinetic sand to adjust the elevation and levels, building the leadership center and creating the new topography, creating terraces, etc. When they made the changes, we used the Microsoft Kinect to scan the new levels. These new elevation levels can be used to create new hydrology. So, the girls can choose the shapes of the rain gardens that minimize erosion levels. All of the garden shapes that the girls chose reduced the runoff coming off the building. Using the Microsoft Kinect Scanner, we can change the elevation, and rerun a simulation. Finally, we put together the large scale model in teams. The girls designed three rain gardens in the area. And they decided on final shapes and sizes.